When men decided that they wanted to emulate birds and fly, the first idea that sprung to mind was to copy them. Having put their minds to designing these contraptions that would take them up into the sky, the first thing that those pioneers noticed was how they used their wings as an element that set them apart from all other living beings. Indeed, wings were the first element to be designed. And they are still there today. Aircraft wings have undergone a remarkable evolution, both in terms of their design and the various functions that they have assumed throughout history. From those wings that were tied to the arms of those daredevils, to the complex wings currently being designed by NASA, which change shape while in full flight. They are not only the main supporting element in most aircraft, they are also used for fuel tanks, engine supports, protection for landing gear, housing for the lights, etc. Also, as a great many of the devices installed in them are managed individually, flying is becoming increasingly safe, comfortable and versatile. 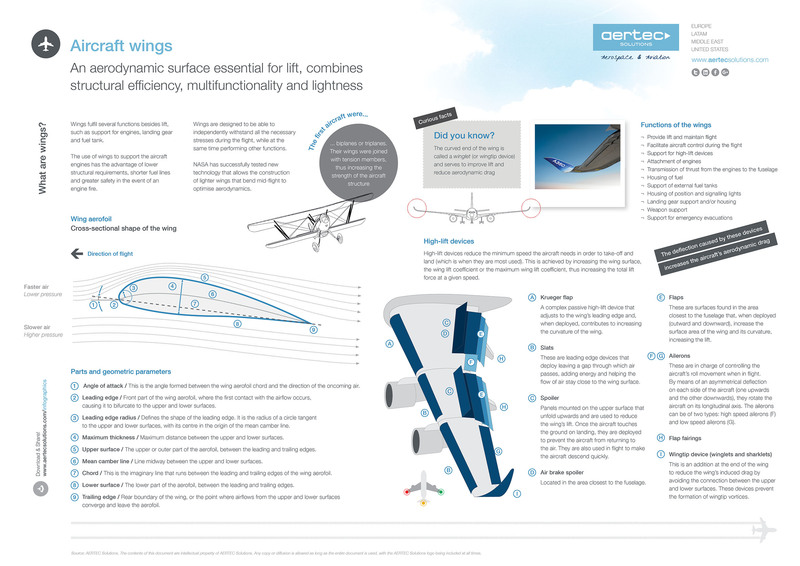 In this infographic, we have compiled some of the most important features of wings and explained their most essential elements. From now on, we hope that when you look out of the window of your aircraft, you can recognise these elements and know what each of them is for. Have a good flight!